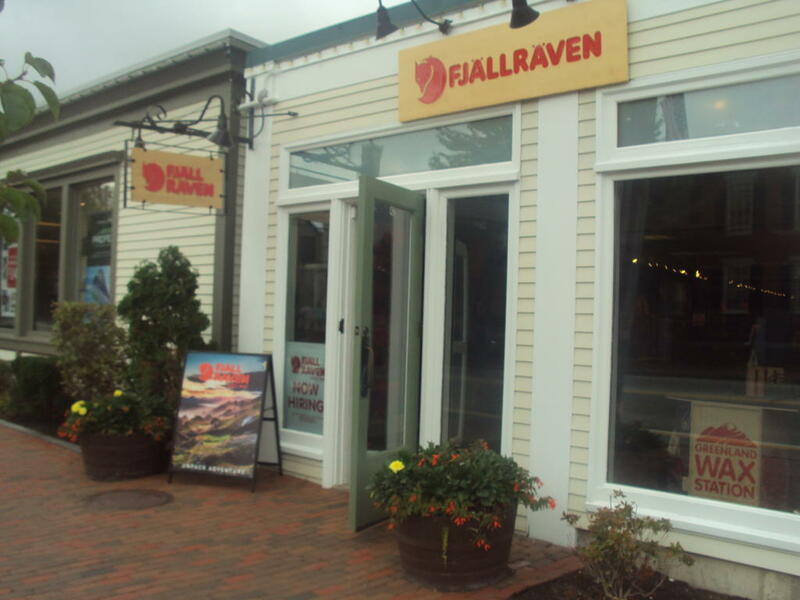 Fjällräven, the Swedish brand that specializes in outdoor wear, is a new business at 42 Main St. in Freeport. There are two successful kitchenware stores in Freeport, as well as several bed-and-breakfast facilities and more than a few stores that sell outdoor gear. Three new business that specialize in these products or services are confidently marching into the breach, however. The Kitchen Collection will begin operations on Oct. 7 in Shaw’s Plaza. The owner of The Orchard House & Cafe, located at the site of the former Frost Gully Gallery, hopes for a soft opening of the inn section of his business sometime this winter, and Fjällräven, which specializes in outdoor wear, opened for business at 42 Main St. in August. Randy Sklenar, vice president of operations for The Kitchen Collection, which operates 220 stores nationwide, is confident his company will do well in Freeport. Casco Bay Cutlery & Kitchenware and Corning Corelle and More are similar operations in town. Sklenar said that The Kitchen Collection runs 80 percent of its stores in outlet centers, such as Freeport and Kittery. The company’s only other Maine store, in fact, opened in Kittery 25 years ago. The Kitchen Collection is big on gadgets, and features a “As Seen on TV” section that is popular with shoppers, he said. Sklenar said that his company’s location, near Carter’s, will be temporary. The Kitchen Collection will move within walking distance, nearer to Shaw’s, next spring. But company officials wanted to be open for Freeport’s busy fall tourist and holiday shopping seasons, he said. The store will be open every day, and will employ six to eight people, Sklenar said. Dennis Spangler, e-commerce and marketing director for The Kitchen Collection, said that the company is joining the Greater Freeport Chamber of Commerce and already has enjoyed working with its executive director, Stephanie Petkers. Elsewhere, William Hamlen purchased the former Frost Gully Gallery, which was run by the late Tom Crotty, from the Crotty family in early August. He is living on the premises, having just moved to Freeport from Cambridge, Mass. He hopes to open the cafe in March. Hamlen, whose family hailed from Portland, worked in sales in Massachusetts. He was looking online for property, and the Frost Gully Gallery, at 1159 U.S. Route 1, fit the bill. Hamlen said that the gallery and home has a “sprawling” floor plan. The gallery was an add-on to the house and barn, which were built in 1850, he said. Hamlen will live above the old gallery, and downstairs he will display some of Crotty’s work, as well as that of other Freeport artists. “I feel the town has a very strong art influence, and they knew Thomas Crotty,” he said. The cafe and the inn, consisting of three to four bedrooms, will be situated in the original home, with separate entrances. Petkers likes the idea of a business such as The Orchard House & Cafe in that part of Freeport. “I’m really excited about something going on north of the village,” she said. Hamlen will provide updates on his progress renovating the property at theorchardhouseandcafe.com. On Main Street, Evan Gordon of Brunswick is store manger for Fjällräven, which is competing against L.L. Bean, The North Face and Patagonia. Fjällräven is a Swedish company specializing in outdoor equipment, mostly clothing and rucksacks. Gordon said that Fjällräven is different from the others. Gordon, who once managed the Oakley Vault in Freeport Village Station, said that the location, right in the downtown shopping area, is good for the store, which has six to eight employees and features discounts of 30-60 percent. Amid all the activity, an established business, Brett Davis Real Estate, is moving its offices from Bow Street to nearby 12 School St., home of the former Wishful Moon.